It looks like the stock market roller coaster is set to continue. After weeks of ups and downs, the stock market erased its November losses last week. This came after Federal Reserve Chairman Jay Powell said that interest rates were “just below” the normal level. Regular readers know the market has been in a tailspin because of rising interest rates. According to Chairman Powell, the pace of rate hikes may slow. That doesn’t mean the market will stop feeling the effects of higher interest rates. Because according to the data, rising interest rates is bad news for most stocks. As we’ve discussed before, higher interest rates raise the cost of running a business. And that can lower company earnings and weigh on share prices. But not all stocks are created equal. According to ETF provider Global X Funds, between 1960 and 2017, the stocks that performed best in a rising rate climate were high dividend paying stocks. 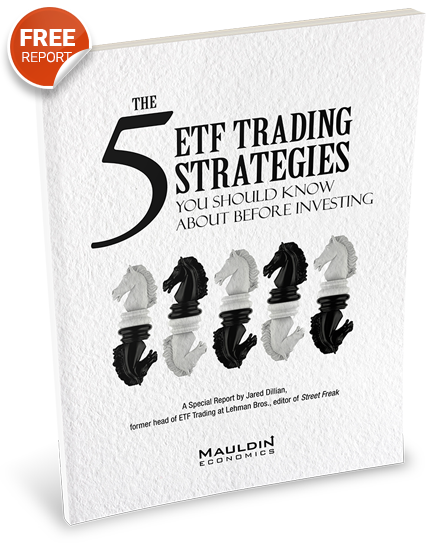 According to the study, stocks that paid 6.4% or better had higher returns than the S&P 500. And there’s one big reason why this is the case. Stocks with big dividends did better than the S&P 500 in 7 of the 10 periods where interest rates were climbing. But there’s a catch with these stocks: their dividends are often very risky. That’s where I come in. I developed a tool that helps gauge the safety of a company’s dividend. There are three key company traits that tell you if a dividend will be cut. The first is the payout ratio. The payout ratio is the percentage of net income a firm pays to its shareholders as dividends. The second is the debt-to-equity ratio. When a company carries a lot of debt, it makes it harder to fund the business. This includes—you guessed it—paying the dividend. The third is free cash flow. This is the amount of cash left over after a company pays its expenses. It’s a key component to paying a dividend. 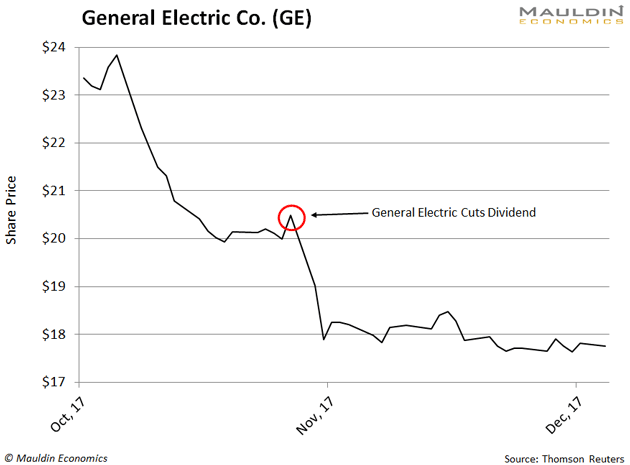 Anyone who looked at these measures and others would have known that GE’s dividend was in trouble. That’s exactly what my system does. Because if a dividend isn’t safe, the odds are high that a company will be forced to cut it. And that’s bad news for shareholders. General Electric (GE) has been all over the news lately. The former industry titan founded by Thomas Edison has been a slow-moving train wreck for nearly two years. One chapter in this saga was on November 13, 2017 when the company cut its dividend for the second time since the Great Depression. In the days following the announcement, shares of GE fell 10.5%. A year later, shares would be down 57.2%. But to a seasoned stock analyst, the dividend looked doomed. Prior to the announcement, GE had a dividend yield of 4.7%, triple that of the S&P 500. It looked tempting, but if you looked closer it was obvious a dividend cut was looming. At the time, GE was losing money and had a high payout ratio of 111%. The company was actually dipping into its cash reserves to pay the dividend. And GE was also struggling with a high debt-to-equity ratio and its free cash flow was falling. When I plugged GE’s historical data into the DSI, it scored a reading of 10% out of a 100%. GE didn’t even come close to making the cut. Here are three stocks that scored very well on my proprietary DSI system. AbbVie Inc. (ABBV). This pharmaceutical company scored an 81% on the DSI. Its 4.9% dividend yield is nearly three times the S&P 500. And with growing free cash flow, low debt, and a payout ratio of 67%, ABBV’s dividend is safe. Exxon Mobil (XOM). I know what you’re thinking: hasn’t the oil price been crushed? Yes, but the company is very diversified and doesn’t trade in unison with the price of oil. Over the last three months, the oil price has crashed 24.3% and the S&P 500 lost 7.2%, but shares of Exxon Mobil are down a mere 4.1%. The company scored an 85% on the DSI, and its 4.3% dividend yield is a safe bet for income investors. Leggett & Platt Inc. (LEG). The company designs and manufactures engineered components and products. The company scored a 73% on the DSI and has raised its dividend for 27 straight years. With a strong balance sheet and a low payout ratio, I believe the company will raise it for a 28th year in 2019. I have one more company that scored a perfect 100% on the DSI. However, that company is reserved for subscribers to my premium dividend investing service, Yield Shark. The thing to remember is that you want to hold high dividend paying stocks when interest rates are rising. But—unlike GE—you want to make sure the dividend is safe. Most of all, don’t be tricked by high dividend yields. Dec. 5, 2018, 1:21 p.m. This is an interesting article, but the lead in is that, according to the global X study, high dividend paying stocks outperform when rates are rising. This study apparently showed that this was true for stocks paying greater than 6.4% in dividends. None of the 3 individual stocks that you discuss in more detail pay anywhere close to that amount, so I don’t see how they are relevant to the discussion.